For more than 40 years I have been a night owl. I love the quiet time when everyone is asleep. I’ve NEVER desired to be a morning person. For years, night has been my most productive time. I'd get things DONE when there were no interruptions from little people. Since 2002, I've had 2-3 teens in the house. I love my teens but I do not love their ability to stay up late and wreck my quiet productive time. On the other hand they don't pop out of bed as early as they did as little guys so my quiet has shifted to the early morning hours. For some reason my brain has decided that 6:30 is a good time to get up. In August, Steve was gone with the younger kids on a canoe trip and I was home with Elizabeth. I thought we would both be sleeping in. EVERY.SINGLE.DAY. I woke at 6 a.m. I even turned off my alarm, yet I naturally woke between 6 and 6:30. That is when Steve gets up to get ready for work. Our daily routine had "trained" me to wake up when he got out of bed. My night owl self was shocked. But I embraced it. I went to bed at a decent hour instead of staying up late. So I was well rested when I got up. It was amazing. I got SO much done. With my family mostly gone for 10 days, I had big plans to fix the chaos in my work room. Several days I quit by noon and I still got a HUGE amount of work done. I am less alert at night lately. Probably because of being up earlier each day. My body is ready for sleep around 10 p.m. so I’ve been adjusting my bed time as well. If I go to bed and get 7-8 hours of sleep I am super woman the next morning! I thought this change might be temporary. Maybe I was waking up early so I could get more done while my family was away. I LIKE sleeping in. But its hard to sleep in when your brain is awake. Trust me I have tried. So instead of being grumpy and resisting(tried that too), I am claiming "morning person" status. Seriously it is so strange to have this shift occur. My friends don't know who I am. This is NOT me. There's even been a few 5:30 mornings. It is bizarre. I'm not encouraging this radical change for everyone out there. BUT if you find yourself up early then I say EMBRACE it and use the time wisely! It is a great time to do things that require quiet focus. Here are the details on how I've changed my mornings to be awesome and use the time when no one is up. Since mornings are new to me I needed some help. Luckily thearticle How to become a morning person popped up on Facebook just when I was thinking about reforming my ways. Thanks Facebook for reading my mind. Also Morning Tips for Night People was VERY helpful. I was surprised at how many people have made this change from night to morning. I love Crystal Paine's Money Saving Mom website for all her wisdom on how to be a money conscious homemaker and when I saw this class I literally snatched it up. It is VERY reasonably priced and TONS of wisdom in the videos and worksheets. 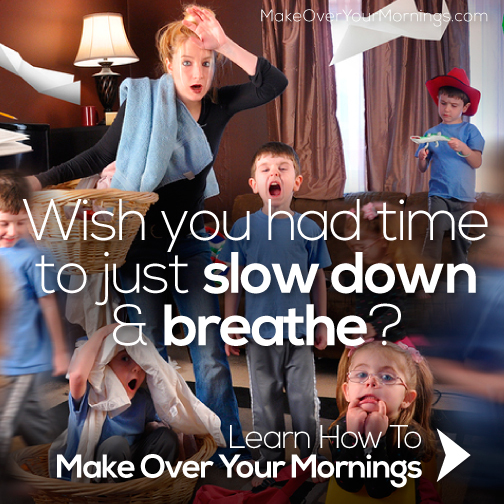 But honestly the BIGGEST help has been the class from Money Saving Mom called Make Over Your Mornings(MOYM). I love Crystal Paine's Money Saving Mom website for all her wisdom on how to be a money conscious homemaker and when I saw this class I literally snatched it up. It is VERY reasonably priced and TONS of wisdom in the videos and worksheets. Plus it's only 14 days long and honestly you can do more than one day at a time to speed through it! Go check out Make Over Your Mornings(MOYM)! As an affiliate I only recommend things that I personally feel are worth your time and money! **UPDATE** I still use the knowledge gained from MOYM a year later and NOW this week (August 8-15th) you can buy either Make Over Your Mornings(MOYM) or Make Over Your Evenings) for $10 (normally $17)! And an added bonus, if you buy one title for $10, you can get the other title for $7! Hurry It's only available at this price for 7 days!!! !